Radio talk show host John DePetro was pulled from the air after he made a derogatory remark yesterday about the sexuality and the weight of Green-Rainbow party gubernatorial candidate Grace Ross. "This corporation has zero tolerance for this type of nonsense," George Regan, spokesman for the station, said last night. "It will not be tolerated. We are now in the process of an investigation. 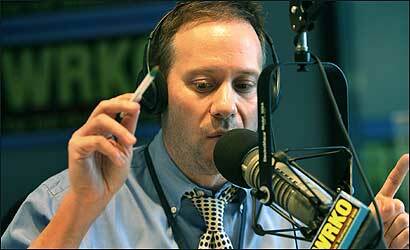 Mr. DePetro will not be heard on the airwaves of WRKO-AM tomorrow morning." Regan said that Entercom Communications, the owner of WRKO, will have a further statement today. Regan said that DePetro apologized on the air yesterday after making the remark about Ross, but that WRKO executives were not satisfied. DePetro was suspended for two days in July for using a homosexual slur on his show to describe Matthew J . Amorello, who was chairman of the Massachusetts Turnpike Authority at the time. It was unclear last night what DePetro said on the air, other than a description of the candidate's sexuality and weight. Regan refused to provide a tape of the show. DePetro did not return phone calls seeking comment. For her part, Ross laughed when she heard about DePetro's remark. "That's my honest response," she said, chuckling. "First of all, this is not news to folks that I'm a lesbian. It's on my website. Big, fat? I guess that's supposed to be his way of saying he doesn't like somebody. The real issue here is that we have a whole subculture of right-wing talk show hosts who think they're more important than they are." She said that DePetro is free to question her views and proposals, but that "this kind of behavior is wildly inappropriate." Asked whether she thought DePetro should be fired, Ross said, "I don't think I should say who gets fired or doesn't from a job I have no legal responsibility for. But what I do feel is that the quality of public discourse in this campaign is in the mud pit, rolling around. I would hope that WRKO recognizes the power of the airwaves and doesn't want to contribute to what is essentially negative campaigning." After Imette St. Guillen was slain in New York City in February, DePetro said the 24-year-old college student from Boston was "asking for trouble" by being alone in a bar at 4 a.m. The comment outraged St. Guillen's mother and sister and made headlines, but WRKO did not punish the host. In July, DePetro, who calls himself The Independent Man, used a slur to describe Amorello. After making the comment, DePetro said: "I don't mean gay; I mean like sissy boy." The talk show host, who has been on the air at WRKO-AM for three years, made the remarks while talking about Amorello's decision to bring his wife, Charlotte, and spokeswoman Mariellen Burns to the funeral of Milena Del Valle, the Jamaica Plain woman who was killed when the Big Dig ceiling panels collapsed.